The Wildcat (Felis silvestris), sometimes Wild Cat or Wild-cat, is a small felid native to Europe, the western part of Asia and Africa.. It is a hunter of small mammals, birds, and other creatures of a similar size. There are several subspecies distributed in different regions. Sometimes included is the ubiquitous domestic cat (Felis silvestris catus), which has been introduced to every habitable continent and most of the world's larger islands, and has become feral in many of those environments. The Wildcat is extremely timid. It avoids approaching human settlements. It lives solitarily and holds a territory of about 3 km². A study by the National Cncer Institute suggests that all current house cats in the world are descendants from a group of self-domesticating Wildcats 10,000 years ago, somewhere in the Near East. The closest relative of the Wildcat is the Sand Cat (Felis margarita). 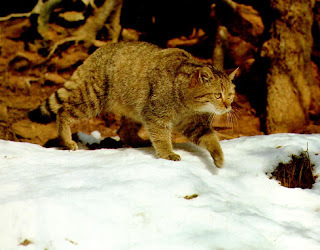 Felis silvestris silvestris (Europe and Turkey). Felis silvestris lybica (North Africa, Middle East and Western Asia, to the Aral Sea)..
Felis silvestris cafra (Southern Africa). Felis silvestris ornata (Pakistan, north east of India, Mongolia and northern China).